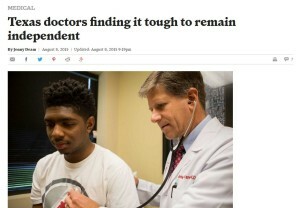 A Saturday Houston Chronicle article describing the difficulties faced by Texas independent doctors echoes some of the complaints collision repairers have with insurers. An independent streak is deeply ingrained in Texas medicine, but these days it’s becoming a struggle for smaller practices to remain autonomous. Reimbursement payments are dropping, and insurance companies are becoming less willing to negotiate with smaller players, many doctors say. Mix in new regulations under the Affordable Care Act, often requiring additions of staff and expensive technology services, it is small wonder some independent doctors feel they are in quicksand. The article gives the example of Houston OB/GYN Dr. Bart Putterman, who received $1,700 from insurance to do a routine delivery (no C-section) and give pregnancy care in 1988. Thirty-one years later, insurers reimbursed him $1,500. Adjusted for inflation, that $1,700 should have been $3,082.95 in 2009. “They would say, ‘We don’t really care what you think your services cost, this is what we’re going to do,'” he told the Chronicle. In recent years, hospitals have been on a buying spree, luring overwhelmed small-practice doctors with offers to buy them out – and bring their patients along with them. The doctors become employees or enter some type of affiliation agreement. In this era of consolidation and integrated care, a doctor’s practice that offers a specialty or preventative health is especially attractive – or vulnerable – to a buy-out. In terms of consolidation in the medical industry, the article cites Merritt Hawkins data that found 11 percent of doctors nationally working for hospitals in 2004 — compared to 64 percent in 2014. In any case, repairers should know they’re not alone and insurers aren’t a lot of fun for doctors either. Perhaps there’s room for joint efforts at state Legislatures, or at least pointing out to lawmakers that collision repairers aren’t the only ones facing a particular insurance issue.